Think back to when you were small, watching your favorite cartoon. For me, it was Saturday mornings with Looney Tune characters such as Bugs Bunny and Daffy Duck. 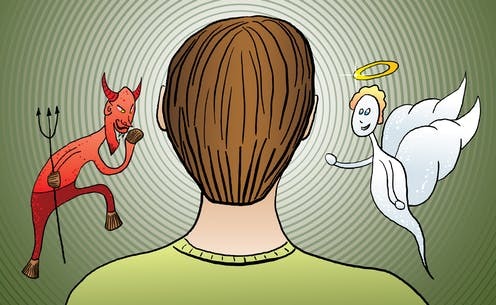 Can you recall an episode or two in which your favorite character is faced with the pivotal choice of good versus bad, or perhaps a “Yes, you can!” versus “No, you can’t!” coming from an angelic or devilish character standing on opposite shoulders? Through science and technology, it has recently been determined that the energies associated with our optimistic and positive beliefs actually correlate to better outcomes in our lives. How can you increase your chances of personal and professional success by exercising and building your angelic belief muscle on a daily basis? This entry was posted in Attitude, Beliefs, Success and tagged attitude, Barry Demp, beliefs, Demp Coaching, success, The Quotable Coach by Barry. Bookmark the permalink.